Welcome to the homepage of SpinCal. 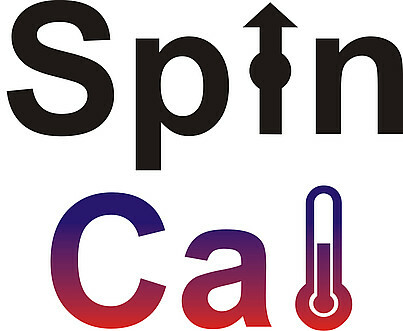 SpinCal stands for Spintronics and spin-caloritronics in magnetic nanosystems, a joint research project (JRP) funded by the European Metrology Research Programme (EMRP). The aim of the project is to enable fundamental understanding of new effects emerging in the field of spintronics and spin-caloritronics in magnetic nanosystems. This goal will be achieved by developing a new measurement infrastructure and a best practice guide for spin-caloritronic material measurements, providing a road map towards future standardisation of spintronic and spin-caloritronic measurements, materials and devices. So spintronics, or spin-based electronics, is an emerging technology exploiting both the fundamental properties of electrons: its elementary electric charge and its intrinsic angular momentum (spin), to which a magnetic moment is associated. Fundamental research in the field today known as spintronics has led to the highest level scientific discoveries, such as the giant magneto-resistance effect awarded the Nobel Prize in Physics in 2007 (Albert Fert and Peter Grünberg) and to important industrial applications such as hard disk read heads and automotive sensors. Spin caloritronics is the science and technology of controlling heat currents by the electron spin degree of freedom (and vice versa) , and has recently emerged from the combination of spintronics and thermo-electricity. It has led to the observation of fundamentally new effects such as the spin-Seebeck effect and thermally induced spin injection. Such effects could offer novel device applications for industry and metrology such as magnetic control of heat flux in a magnetic heat valve. However, to date, many advanced concepts only have a theoretical basis and need to be studied experimentally. Furthermore, this new field requires reliable techniques for the measurement of spin-caloric properties to underpin future materials research and applications.